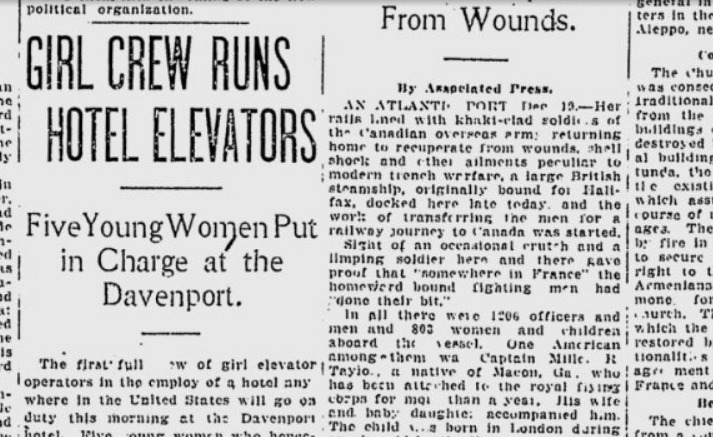 100 years ago in Spokane: With men sent to fight World War I, Davenport Hotel hires first ‘girl elevator operators’ in the U.S. UPDATED: Wed., Dec. 20, 2017, 6:20 a.m.
Why did the Davenport replace the usual elevator boys with elevator girls? There were two main reasons, said Louis Davenport. Davenport said this was just the beginning of a new wartime plan at the hotel, which “contemplates the employment of girls in many departments now handled exclusively by men.” He predicted the hotel would employ 100 more girls than in pre-war times. Published: Dec. 20, 2017, midnight Updated: Dec. 20, 2017, 6:20 a.m.